Fire sprinklers are so frequently seen in our daily lives that we often take them for granted. Fire sprinklers are so frequently seen in our daily lives that we often take them for granted. In fact, you might not even think about the fire sprinklers in the building where you work, shop, or study until a fire breaks out and they activate. So, what are some frequently encountered myths about fire sprinklers? Keep reading to find out. 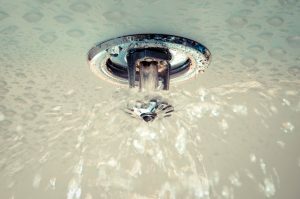 Contrary to what you might think, fire sprinklers are not meant to all turn on simultaneously when a fire starts. In fact, most fire sprinkler systems are configured that they will activate as needed depending on the size and ferocity of the nearby fire. Studies have found that the overwhelming majority of fires in residential settings are brought under control by two sprinklers, at most. Also, consider how many sprinklers are positioned in a particular room – ninety percent of the fires that break out in these settings are fully extinguished once six sprinklers activate. Another frequently-seen myth is that fire sprinklers are unsightly. While this may be true of older fire sprinkler systems, modern ones are much more attractive. Are you stuck on deciding which fire sprinklers to add to your building? There are many options you can choose from when it comes to shape and size. You can also opt to hide them since fire sprinklers for a residential building are less noticeable. It’s normal to worry about the consequences of fire damage. Even the smallest blaze can leave plenty of smoke and soot behind. However, you might not expect sprinklers to cause excessive water damage while attempting to control the flames. Thankfully, this most likely won’t be the case. As we already mentioned, fire sprinklers will only go off under highly specific and narrow conditions. When firefighters respond to finish putting the fire out, they might use even more water than the sprinklers would. Why might you believe you don’t need to have fire sprinklers that work correctly? Even if you have full confidence in your smoke alarms, that doesn’t mean you don’t need sprinklers or extinguishers at the ready. Why is this? Any alarm systems you have in place can only notify you of a fire that has started, but they can’t do anything to fight the fire. This entry was posted on Friday, November 10th, 2017 at 9:15 am. Both comments and pings are currently closed.